The world's largest bird - the ostrich - tastes more like red meat than fowl, and ostrich farming is more environment-friendly. Ostrich. It’s what’s for dinner . 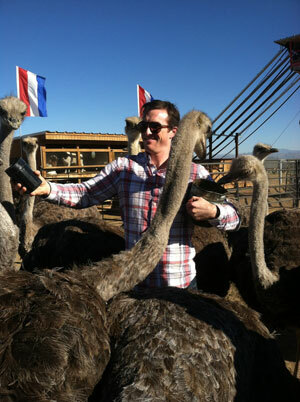 . .
Alexander McCoy feeding ostriches on his farm. At least that’s what Alexander McCoy hopes. McCoy is a banker who turned ostrich farmer after training for an Ironman competition. Ostriches are the world’s largest birds. But their meat does not taste like chicken. Instead, it resembles beef in taste, color and texture. So it could be a way for Americans to eat burgers and steaks without doing as much harm to their own health or the environment. McCoy says ostriches do not require as much land as grass-fed cows. And the birds don’t produce as much climate-warming methane when they digest their food. Most ostrich is currently consumed in other parts of the world. The birds have not been popular in the U.S. since the early 1900s, when feathers were a hot trend in the fashion industry. But as more Americans reduce their beef consumption for health and environmental reasons, they may be willing to try ostrich. McCoy is optimistic. Photo: Courtesy of Alexander McCoy. Ostrich steaks go on sale at Aldi – but are they worth tucking into?